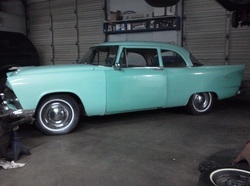 Customer asked if we could put a V8, 4 speed and modern steering and brakes on his Plymouth Plaza. Big job, but we're used to em. Plenty of room for a V8. Since first generation Dakota pickups were available with a V8, have rack and pinion steering, disc brakes and the frame rails are close to the same width as the Plymouth, they are an excellent donor vehicle. First thing we do is remove the front clip so we have easy access to the frame. Removed the engine and transmission revealed a solid, but dirty frame. Not bad for being 60yrs old. Measure not once, but twice and mark frame. Now time to break out the plasma cutter and cut the old frame from the Plaza. Time to clean up the cuts. When doing a major project like this, there's always hidden damage to be found. Here we found the body frame mount had been bent sometime during the vehicle's life. This caused the body to sit slightly askew on the frame. Repaired the mount and body now sits straight. Time to bring the Dakota into the shop. After pulling the motor, we found frame rails straight and in good condition. Measure twice, cut once. With the more modern suspension,brakes and steering, the Plaza will handle much better than before. 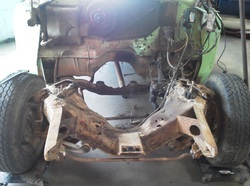 While not a perfect match, it's very close and will require some fabrication to get the Dakota frame to mate up to the Plaza frame. 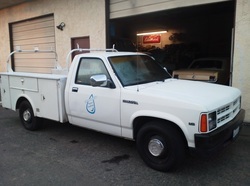 While we wait for parts, check out some of our past projects and check back for updates! We are doing the initial frame fit here. Opening the frame rails on the Plaza allow us some flexibility in getting the Dakota frame lined up correctly. Here you can see the engine mocked up on the Dakota subframe, and the initial mating of the frame to the Plaza frame rails. 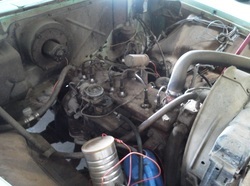 The stock V8 Dakota mounts the engine too far forward for us, and even the aftermarket mounts won't work. So it's time to make our own mounts. Measure not once, but twice. And then again to be triply sure. Frame rails clamped together, screw used to hold sections tight while welding is in progress. Better view of how the 2 different frame rails join together before welding. Time to do some welding. Frame welding complete, frame rails are level and we can move on to the next part of the project. 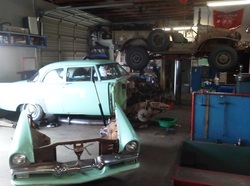 Stay tuned for dropped spindle installation and drivetrain installation. Mocked up the fenders and radiator support. Going to have to do some fabrication to mount the radiator support. Did we say frame welding complete a few pictures ago? Nope, we had to notch the frame rails so the radiator support would clear and allow the nose to sit level. We also took this oppotunity to mate the Plaza's steering column to the Dakota rack and pinion. This allowed us to keep the look and style of the Plaza steering wheel while providing the safety the Dakota collapsing steering shaft came with. Sorry for the delays in updates. Web developer got a case of the lazies and had to sic Shorty on him. While he was slacking off, we rebuilt the Dakota front end with new bushings, joints and rack. Once the front end was rebuilt, we were able to start mocking up the motor so we could create the mounts.